I may be old-fashioned, but when it comes to my e-mail messages, I like to concentrate on the words themselves. So I prefer plain text with no Web-page (HTML) design. And I don’t like fancy colors, background images, font changes, or other garish effects. Thankfully, Apple’s Mail lets you get rid of any images that don’t come attached to messages. Choose Mail: Preferences, click on the Viewing tab, and turn off the Display Remote Images In HTML Messages option. In addition to toning down your mail, this also takes away a favorite tool of spammers (they embed images that are specifically designed to verify that e-mail addresses are valid targets). You’ll just get the prompt back, as though nothing had happened. But the next time you launch Mail and retrieve new messages, you should find that most are now displayed in pure plain text. sends a winking one, and so on. These shortcuts spare you a trip to the smiley pull-down menu (to the right of the chat text field). sends the “innocent” emoticon.) You might think there’s no way to avoid moving your hand to the mouse—but instead, try this all-keyboard solution: just press tab. Doing this should highlight the smiley icon next to the iChat text field. Press the spacebar, and the drop-down menu will appear. Use the arrow keys (all four of them) to navigate through the images, stop at the smiley you want, and then press return. When you do, iChat will insert the image in your message, and you can go right back to chatting. If this trick doesn’t work, it’s because you haven’t enabled Full Keyboard Access. Open System Preferences, click on the Keyboard & Mouse pane, and then click on the Keyboard Shortcuts tab. At the bottom is the Full Keyboard Access section. Make sure the All Controls option is selected. You can toggle this on and off by pressing control-F7 if you find it annoying in other applications. 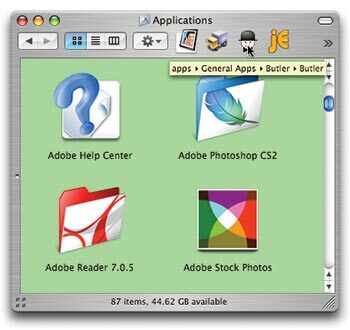 OS X provides a number of quick ways for you to reach frequently used applications and documents. You can keep them in the Dock or you can store them in the Finder window’s sidebar or toolbar. Over time, you might find that these locations become cluttered. And eventually you’ll probably see an icon you’ve long forgotten about. Sure, you could just open it to discover what it is, but you still might not know where to find the original on your machine. For items in the Dock and the sidebar, tracking down this information is a cinch. Control-click on an item in the Dock and choose Show In Finder from the contextual menu. Or control-click on an item in the sidebar and choose Get Info from the contextual menu; the Get Info window will contain the item’s full path. Tooltips Tell Tales Not sure where a certain icon on your Finder’s toolbar came from? Just hover over it, and the pop-up tooltip will reveal all. Unfortunately, control-clicking on a toolbar entry reveals only an option to remove it, along with standard toolbar-view options. Also, you can’t click once to select the item, as toolbar entries launch with a single click. What to do? When you want to find out more about something in the toolbar, hover over that item for a bit. A handy tooltip will pop up, displaying its full path (see “Tooltips Tell Tales”). You can speed the process up a bit by pressing the option key while hovering—the tooltip will display instantly. Do you need to track overlapping events in iCal—for instance, your son has swim class from 4:30 to 6:30 p.m. while your daughter has soccer practice from 5:15 to 7 p.m.? If so, you may wonder how you can create these events in Apple’s iCal. When you’re in Day or Week view (Command-1 or Command-2), you could create a new event and then just drag and drop it to overlap the existing event. But here’s an even quicker way: press and hold Command-option, and then just start dragging at the time you want the new event to start—right on top of the existing event. For instance, if you have an existing 10 to 11 a.m. meeting, and someone schedules a new one at 10:30 a.m., just press and hold Command-option, line up the cursor at 10:30 on the existing event, and start dragging. iCal will drag out a new event as you move the cursor down, and then it will show the two events side by side when you’re done. But what happens if you accidentally click on a link instead of Command-clicking on it? Then that story will open in the current window, replacing its content. The typical solution to this problem is a quick two-step. Click on the Back button to put the news page on screen again, and then Command-click on the link you were interested in reading. Here’s a workaround that can save a step, at least in Mozilla Firefox and Safari. Instead of doing the two-step, just Command-click on your browser’s Back button. The page you last viewed (the news page, in this example) will open in a new tab, leaving the current story active in the foreground. Reader Reductions To reduce Adobe Reader’s launch time and RAM usage, disable some of its plug-ins in the Get Info window. Apple’s built-in Preview application works fine when you need to view a PDF file, but many people prefer the free Adobe Reader 7. Why? Some people work in all-Adobe shops, while others just prefer Reader’s interface and features. Here are two ways to cut down greatly on its startup time and reduce how much RAM it consumes. The Brute-Force Method When you launch Reader, simply hold down the shift key. This disables all plug-ins. You’ll find that Reader loads very quickly but also has quite limited functionality—you won’t be able to click on hyperlinks or search a PDF, for instance. Reader will return to normal the next time you launch it. The Selective Method Instead of disabling all plug-ins, you can selectively and permanently disable those you don’t need. Make sure Reader isn’t running, and then open the Adobe Reader 7 folder in the Applications folder (this trick should also work with previous versions of the program). Within the Reader folder, select the Adobe Reader 7 icon and choose File: Get Info, or just press Command-I. In the Info window that appears, click on the gray triangle next to Plug-ins to reveal the list (see “Reader Reductions”). To disable a plug-in, click on the box next to its name to remove the check mark. 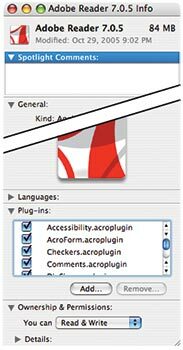 You can disable every plug-in except the following four: WebLink.acroplugin, ImageViewer.acroplugin, EScript.acroplugin, and Search.acroplugin. Leave these enabled so you’ll be able to click on links, see slide shows, and search within PDFs. That’s all you need to do. Close the Info window, and then launch Reader. When I use OS X’s Activity Monitor (/Applications/Utilities) to look at Reader’s memory usage on my Mac, I see that it now uses 15MB, instead of the 30MB it required with all plug-ins enabled.